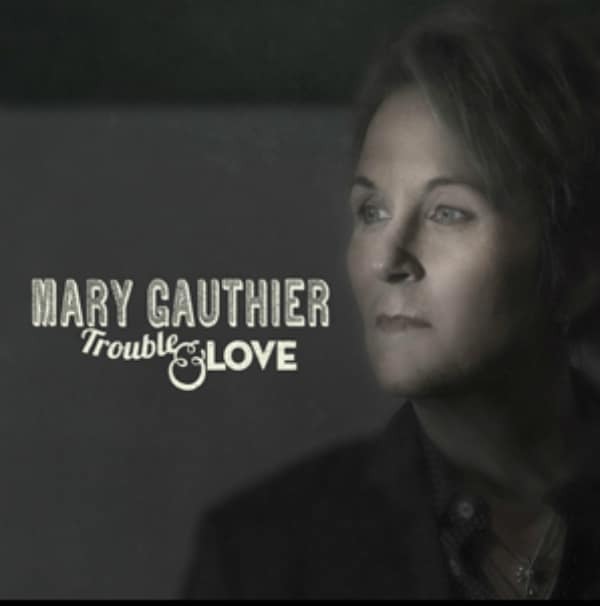 “Who likes to think about their pain?” Mary Gauthier observed in “Sideshow,” a rollicking standout from her 2010 autobiographical outpouring The Foundling. Her newest release, Trouble & Love, is all about looking pain straight in the eye. Gauthier’s fans might expect her unvarnished voice to lead them to defiant statements about a myriad of things that can beat you down – they can do this or that to me, or I can do this to myself, but I’m still standing – and Trouble & Love offers that, in a way. But it’s a long-form struggle, a look deep inside one conflict that takes an entire album to come close to resolving. The eight songs, culled from a crop of 30 that came in the wake of a difficult breakup, become dirge-like if you put them on in the background. Shut out the distractions and bring them in close, and they become razor-sharp reflections of the long road out of purgatory. Aided by some of Nashville’s finest, including guitarist Guthrie Trapp, bassist Viktor Krauss, drummer Lynn Williams, and a pitch-perfect crew of harmony vocalists including Beth Nielsen Chapman, The McCrary Sisters, Darrell Scott, and Ashley Cleveland, Gauthier cycles through the hurt and regret to a place where she can move forward. Near the center is “Worthy,” where Gauthier finds the beginning of the path back up. “‘Worthy,’ what a thing to claim!” she sings, her voice revealing that she’s had to work hard at believing it herself – and that’s the kind of experience you keep for life.